You see, while we’re all familiar with a grown up looking, eyebrows raised, over the top of one’s spectacles, we’re also familiar with the fact that grown ups understand their need for prescription eyewear and will go right back to looking through their lenses once the desired affect of the over-the-top expression has been achieved. Littles, however, given the opportunity will avoid looking through their lenses, which is why #littlelenses are designed ‘upside down’. The upside-down-ness ensures that no matter how far forward they tip their little heads or how enthusiastically they raise their eyebrows, they can’t look over the top, they must look through. If you think Little’s lenses look a little odd you should see the alternatives, there’s a particularly peculiar brand that look like the kind of swimming goggles a water-phobic frog would wear. And don’t even get me started on the choice of colours – or rather lack thereof – we were given a choice between maroon-purply-pinky frames and fire engine red. We went with the former, obviously (I mean, Cotton Kids, to the best of my knowledge, doesn’t do a ‘primary colour’ range). But how do they stay on, you ask? Well, there’s a strap that hooks onto the arms of her frames and ‘wraps’ around the back of her head, keeping them firmly in place. The strap is not unlike a bra strap, in fact it’s just like an adjustable bra strap – complete with that sense of relief that comes from unclipping it at the end of the day (in Little’s case ‘bath time’). So, there you have it. 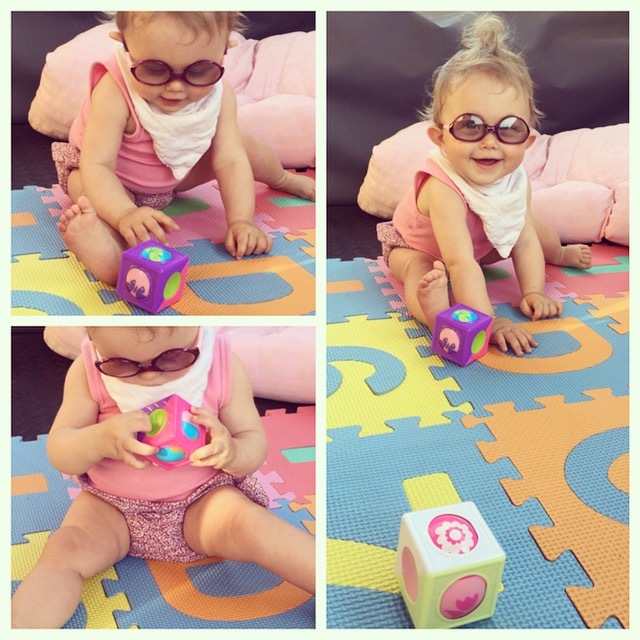 The next time you find yourself looking at #oopsanotherpicofmykid and wondering whether or not you should break the news to me that Little’s glasses are upside down, now you know that the oddness is actually baby-proof cleverness.